Updated Sunday, Nov. 5, 2017, 9:10 p.m. EST: Several reports have identified the man who fired numerous times inside the First Baptist Church in Sutherland Springs, Texas, as 26-year-old Devin Patrick Kelley. The New York Times confirms that at least two anonymous law-enforcement sources told the outlet that Kelley, who lived in New Braunfels, Texas, was the perpetrator in the Sunday-morning attack that left 26 people dead. Victims ranged in age from 5 to 72 and included a pregnant woman and several children. The Times reports that Kelley had served in the Air Force at a base in New Mexico and died shortly after he opened fire at the church. Kelley was armed with a Ruger military-style rifle when he perpetrated the attack. Updated Sunday, Nov. 5, 5:30 p.m. EST: The 14-year-old daughter of church pastor Frank Pomeroy was one of the victims killed, CNN reports. Neither the pastor nor his wife was in the church when the shooting took place. Another mass shooting has taken place in the United States, this time claiming more than 20 lives, according to reports. 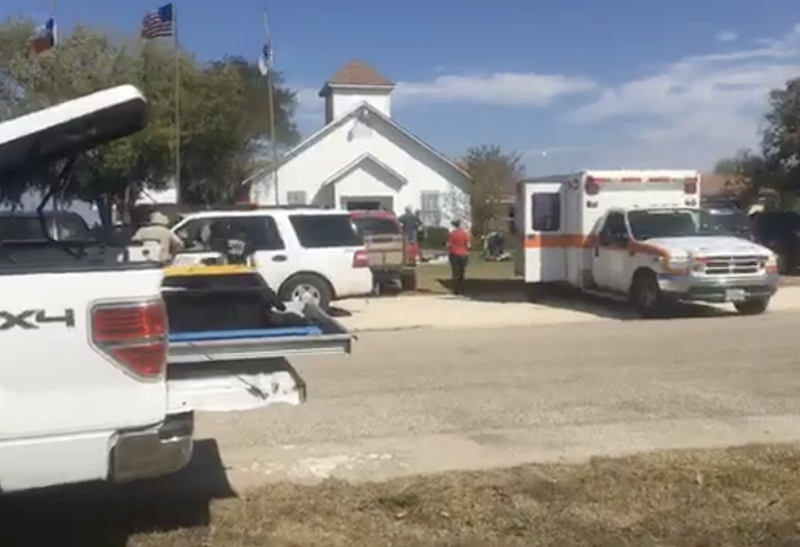 CNN reports that the FBI; the Bureau of Alcohol, Tobacco, Firearms and Explosives; and local police are now responding to the scene at the First Baptist Church in Sutherland Springs, Texas, where a gunman opened fire during Sunday-morning church services. A witness told the news outlet that she heard about 20 shots being fired in quick succession while a church service was underway. A law-enforcement source told CNN that a man walked into the church and began shooting about 11:30 a.m. local time. According to a local station, KSAT-TV, the unidentified shooter, a man, is dead. CNN reports that he died after a brief chase north into neighboring Guadalupe County. It is unclear if the shooter was killed by police or took his own life, a police spokesperson said. The church’s Facebook page shows a recent Fall Festival with parishioners dressed up in Halloween costumes. The incident harks back to a 2015 incident at the Mother Emanuel African Methodist Episcopal Church in Charleston, S.C., where Dylann Roof shot and killed nine parishioners during an evening Bible study. That mass shooting was racially motivated. The First Baptist Church in Sutherland Springs does not appear to be a black church. President Donald Trump tweeted his condolences from his trip to Asia. Editor’s note: An earlier version of this story said that 27 people were dead, per a CNN cable news report, but that has not been confirmed.